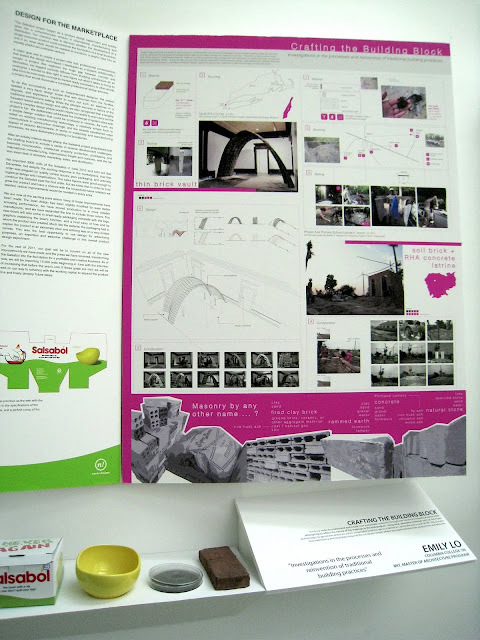 I missed the reception, but got to see my work and others on display for the 3rd annual Barnard + Columbia Architecture Alumni Show when I returned for my class reunion at the beginning of the month. The title of the exhibition is "Progress | Process," essentially looking at the ways in which the design process has evolved. (Brief below.) The work is on display on the 4th floor of Barnard's new Diana Center, so check it out if you're in the City. Instead of sharing studio designs, I decided instead to showcase two different ways of rethinking the building block from a very material standpoint. No sleek renderings here, but instead I introduced a little dirt. Yes, these are group projects (thanks to teams MRG and D-Lab Building Materials aka RHA), but I'm ok with not being the sole author in these innovations. Sometimes better work develops with more brains than one, and this is often the case anyways with most design and research. In her essay Theory After (After-Theory), Ashley Schafer identifies the emergence of the promiscuous architectural practice, one that works seamlessly through design, contextual study, building, and writing, as a new, agile modus operandi within and beyond the discipline. This conflation of material and theoretical practice (design and concept) fosters great diversity in ways of working, which can be calibrated to suit the constraints of a specific project and the designer’s unique conceptual biases. The Barnard + Columbia Architecture Department offers a similarly pluralistic and promiscuous pedagogy as evidenced by the diversity of its multi-disciplinary faculty and the resultant varied approaches to design instruction. It is hoped that exposure to and experimentation within this liberal environment challenges students to work dynamically, crafting and continuously refining their own program(s) of design research. This year’s Alumni Exhibition seeks to uncover how the design process continues to evolve after graduation.